Supply chain managers are involved in all facets of a business for both physical and intangible goods. They handle such things as procurement, production, operations, and logistics from the point of origin to the point of consumption. They’re also often responsible for reverse supply chain management, which includes returns, recycling or disposal of products. Our Bachelor of Business Administration with a Concentration in Supply Chain Management will equip you with the skills to assess, enhance and build this crucial business process. You’ll be prepared to be a buyer, inventory manager/analyst, forecast analyst, materials requirements manager, supply chain management director, vice president of operations, or chief operating officer. 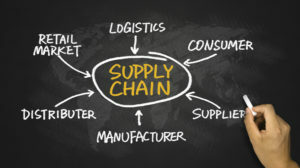 Supply chain managers are in high demand as businesses place greater emphasis on supply chain expertise in order to maintain competitiveness in their industry. The proficiency of Anderson students as supply chain managers provides them an advantage in the job market after graduation. Grads will be prepared for careers as buyers, inventory managers, materials analysts, purchasing agents, as well as top-tier positions, such as director or vice president of supply chain management. Our concentration in Supply Chain Management is one of several concentrations from which you can choose when you enter AU’s Bachelor of Business Administration program. In addition to coursework in supply chain management you’ll become fluent in many aspects of business, including accounting, finance, economics, human resources, marketing statistics, information technology and law. For more information about the BBA in Supply Chain Management @ UCG, please contact Chris Woodlief, 864.231.5510 or email @ [email protected].